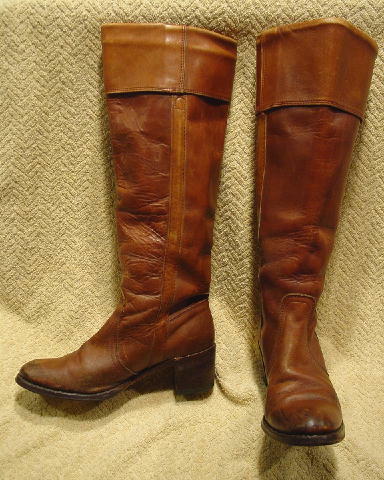 These vintage leather Frye boots are in a saddle tan. They have rounded toes and wood stacked heels. There are 3 1/8" wide upper cuffs which have the color worn off in spots at the top. They have caramel color linings and inner fabric boot straps. These well-loved boots have had their soles replaced quite a while ago. There are scrapes, scuff marks (some dark ones) all over the foot and heel area of both boots, and wrinkles on the vamp. The left boot vamp wrinkle has a crack in the surface. You can adjust the width of the cuffs. They're from a former New York model, who wore these boots everywhere for quite a few years. Several children later, she no longer wears a size 7.